For those of you who don’t know me, I am an avid outdoor enthusiast and have been dragged across half the country, camping with my parents and siblings,and now in turn do the same to my family. I have tons of true bear stories to tell, which many of you have already heard, more than once. Maybe someday I will write a book and tell you at length about the bear stories, but for now I will just talk about my experience over our last trip in the Sierras. Everyone knows that when you camp in the mountains you always take your life in your own hands as mountains are inherently dangerous. I can think of many ways to die in the mountains; you can fall off a cliff, drown in a white-water river, get bit by a rattlesnake, get lost in the wilderness for days, chased and eaten by a mountain lion, or be attacked by bears. I very well know all the rules of bear country but this time I broke them, sadly. Number one rule, “No food in your tent!” My poor dog Goldie, who is a senior, went camping with us and loves to chase sticks and logs in the water (she always thinks she’s much younger when around water and plays hard acting like she’s three again). We spent a long day at the lake and when we got back to the camp site late in the evening, much to my dismay did I see she was bleeding quite a bit from her mouth and had broken her teeth from playing with the logs. I was able to get the one tooth out of her gum (a souvenir), but I had given her aspirin for her old bones earlier in the day and aspirin makes blood thin so the bleeding wouldn’t stop. I washed the wound out and iced it, but the blood took its time coagulating, dripping down her legs, which she kept licking, and onto her sleeping bag. I washed her legs with warm soapy water heated from the fire. I knew we were going home the next day, which this time I was grateful for because of her condition. However, I was worried because we were sleeping in bear country and the ranger had said bears had been seen in our area and to keep all food locked up. So what to do? Sleep in the tent with a bloody dog steak, or sleep in the car with a bloody dog steak and three coolers? I’ve seen and heard cars and tents both being broken into by bears, neither was appealing. It was a huge dilemma for me and I thought long and hard on it. Like I said, I know the rules of bear country. I decided I didn’t want to be lonely and scared in the car so I slept in the tent with my hubby and my poor, precious, bloody dog steak, breaking all bear country rules. I stayed awake all night armed with my iPhone with the bear app (aptly called scare bear) in one hand and my flash lite in the other, plus a hammer and a pot lid to bang if needed. I was afraid, I didn’t sleep all night, although my hubby did! No bears ever came during the night and thankfully my dog’s bloody mouth finally coagulated and she is fine. We made it out alive that night, but that is the last time I will ever break the rules of bear country. There’s my latest bear story for now and I’m tired so, goodnight! 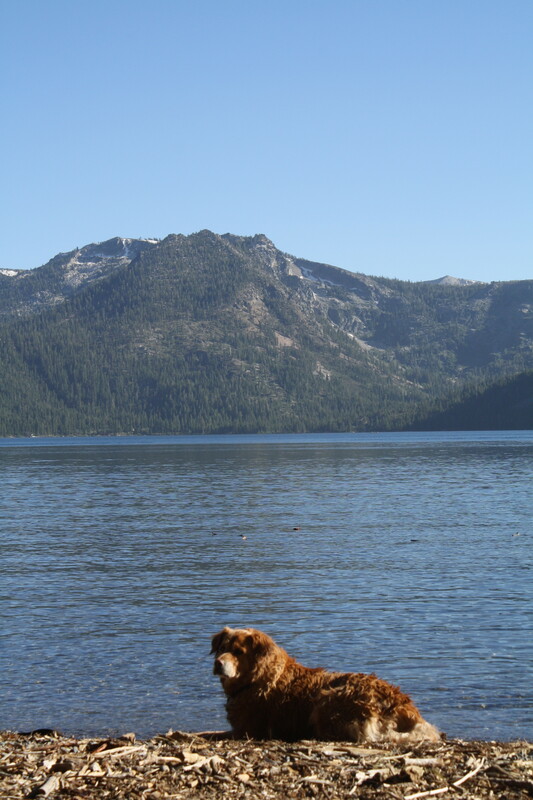 Posted on June 23, 2012 July 23, 2012 by lulabelldesignsPosted in bears, California, camping, dogs, travelTagged bears, camping, dogs, Lake Tahoe, Sierras, wilderness. True story, good job mamma! Great blog! Glad little Goldie is doing fine! Hope to hear more stories soon! We need more bear stories and that’s why we’re going to kings canyon! Where the bears come directly to you picnic table. Dorst campground, Sequoia and Kings Canyon National Park. Bears act like dogs there! We were in bear country?!!! Zoinks!!! 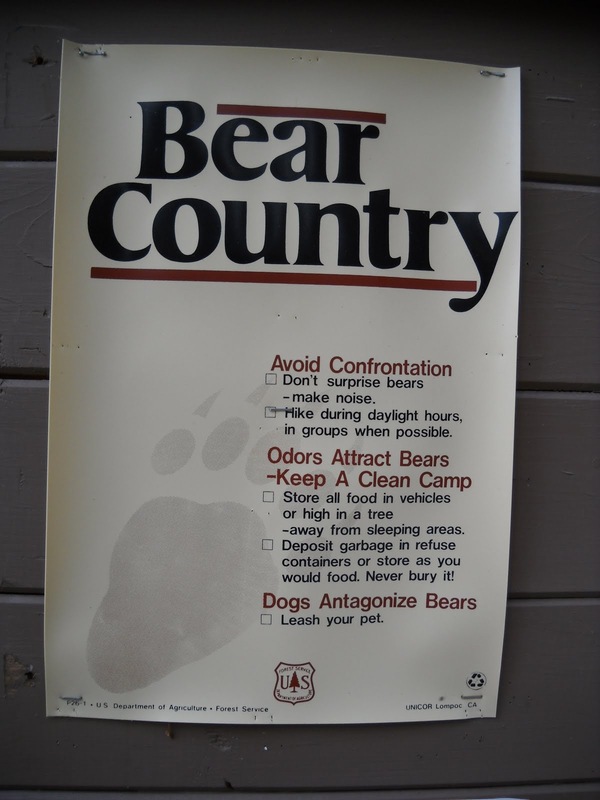 You’re braver than I…we camp but not in bear country! Glad your dog is better and thanks for visiting my blog!